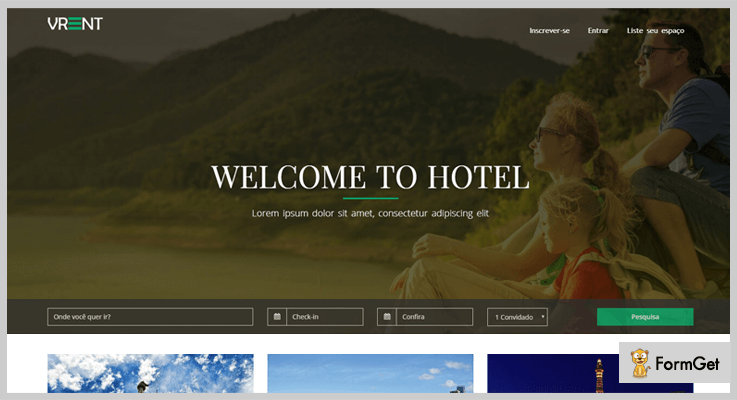 Today, in this blog you will find some of the best and premium PHP Vacation Rental Script that is responsive, easy to use, and helps you apply custom changes. All these listed scripts will help you manage property bookings, payment details, availability status, check-in & check-out details and much more. We are all aware that PHP scripts with above features are hard to find. Therefore we have listed and defined PHP Vacation Rental Scripts that are cost-effective and comes loaded with plenty of features & services. 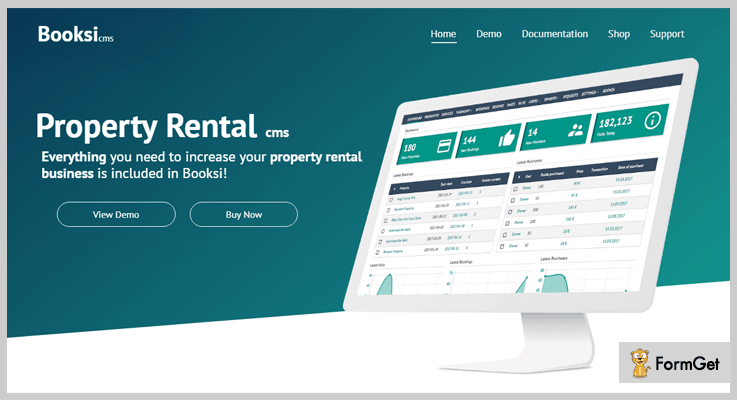 If you want to manage vacation rental, property booking, and other real-estate related details then Eminent is one of the best PHP scripts. Using this you can manage reservations, location details, professional records, along with reports. You can also store custom email templates, crop images, apply custom theme colors, build a menu with drag & drop option. Cross-browser compatibility, responsive design, and different layouts are some add-ons. The regular license offered by this PHP script is priced around $40 with which you can list properties for sales & rental, share images and generate reports. The extended license of the script comes with a price tag of $180. It includes multiple vacation rental features, frequent updates along with 6-month support. With this vacation rental script, you can display amenities, features, description along with property location and other property details. It allows you to collect live booking via credit card, manage split payments, display nightly, weekly & monthly price plans, etc. The script also has an advanced auto price calculator which calculates the price of the property when dates are defined by a user using ajax. Through the dashboard, you can add reservations, manage bookings, departures, transactions, arrivals and other details. 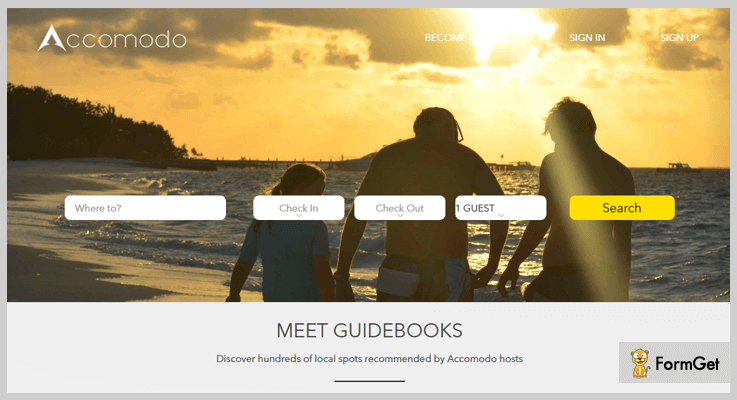 Accomodo is a top-notch vacation rental management system built using PHP, MySQL, and Codeigniter. It helps you handle vacation rentals, apartment rentals, bookings and other essential details. 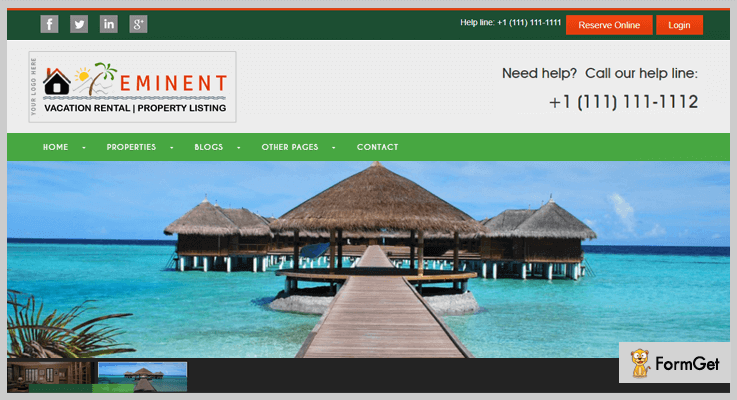 With this PHP script, users can add a description, offers, rules, etc related to the rented property. Other than that you can collect reviews, accept payments, show property rates and other essential details through this script. For the first plan of this PHP rental script, you will have to pay just $20. It offers social login, a user-friendly admin panel, email notifications and other basic amenities. For the second plan, the price payable is $525 with which you get advanced property management features and enhanced services as well as add-ons. The dashboard helps you view details related to user registrations, bookings, homestays, etc. Plus, you can also manage and add places from the dashboard. With this script, effective booking management can be done as various details like username, allowed guests, booking ID, amount, date of booking etc are provided. It allows you to upload custom videos, invite friends via social media, translation support, payment integrations and more. The script also provides a Google API based search, responsive design, PayPal integration, SEO optimization tools and other customization options. Booksi is an easy to install PHP script that offers a fast, secured rental management system. The admin panel helps you manage users, services, apply custom changes and define properties with details. 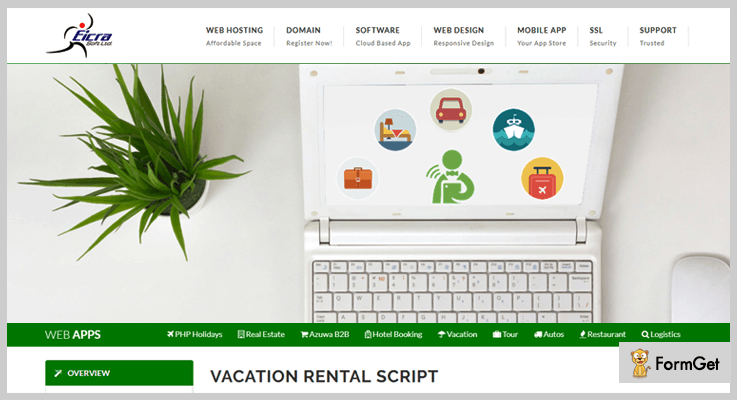 With this vacation rental PHP script, you can approve or reject the different type of bookings, collect user reviews and add more property details. It also allows you to add, import and export language strings for translations. Regular plan of this PHP script will cost you $70 and it gives you full access over multiple booking features and rental services. Extended plan is priced around $405 which includes an advanced dashboard, design styling, payment options and more. The admin panel provides different types of statistic related to visits, bookings, purchases and more. Plus, you can view new properties, booking and member details as well. 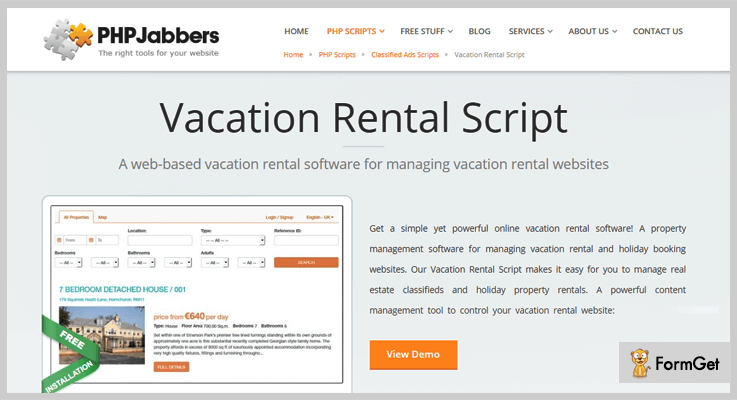 With this Vacation Rental Script, you can easily add, edit or remove services for bookings. Also, you can define category, locations, features and attach images for reservations. Multilingual and multi-currency support is available with this script. Plus, various filters are provided like check-in, check-out, category, location, etc for user help. You can simply add share buttons on the different type of property, service, blog post, etc. In addition, it is compatible with all the latest browsers and devices. This PHP script is an excellent tool to create a holiday booking website like a pro. It helps you to build a multilingual vacation rental website & manage real estate classifieds, guest booking module and much more very effectively. The SEO-friendly property rental software provides email & SMS notification system to stay in touch with the homeowners & guests constantly. For instance, you can inform them about booking confirmation or received payments, notify them after 3 failed login attempts for security concern, send text reminders for pending invoices etc. Similarly, you will also be intimated via SMS when someone makes a booking or a received query etc. User Licence at $49 – With this plan, you get unlimited installations, custom modification option and a lot more. Developer Licence at $99 – In this plan, you can avail free installation support, copyright removal option, free updates etc. Create a user-friendly vacation rental website & provide all the basic amenities to the clients like easy login/signup option, availability calendar, property description, secured payment gateways like PayPal, Authorize.net and much more. The high-tech search functionality allows users to draw a search area on the map & find the properties located in that precise area. With administrator access, you can give advertising option, provide user-level access (owners, clients), manage property status (featured/active/hidden/expired), store backup etc. Furthermore, the admin has content management authority to set currencies, timezone, floor metrics, property display order and many other elements. Property owners to add their rental listing & have their own profiles to review all the bookings and guest contact details. vRent has become the first choice for landlords to create a vacation rental space for guests globally. You can easily make money by having an online vacation rental booking website, where you can also charge a commission to host for a booking confirmation on the website. Host and admin can manage the rental business together like amenities for guests, calendar module to block the unavailable dates and a lot of other things. Get this feature-loaded script at a very affordable price of $60 with 6 months support. You can anytime extend this support to 12 months by paying an additional charge of $20.63 only. Admin can set up custom prices per day, price per weekend for the property, service charge, cancellation fee. You can easily attract guests by setting discount prices when a client books for a longer period. The social sign-in option from authentic sites like Facebook & Google+ is a secure login option for users which also saves their form-filling time. Admin can manage many components like host/guest penalty, static pages & meta tags of the website, reviews from guests & hosts etc. Moreover, the host can also manage the rental service independently in many many aspects. For example, he can have direct communication with the guest through the message communication system, mark the property as listed/unlisted for the users, check reservations etc. If you want to list properties of varied categories like beach houses, cottages, villas, cabins etc, then this script is surely the best option to choose. The script offers multi-language & multi-currency support for global usage. Also, it provides a powerful admin panel to manage property details & services offered to the customers. Professional Plan – It is available at $49 for unlimited bookings & users plus API integration. Unlimited Plan – You can get this plan at $999 and avail unlimited booking & accounts. On Demand Plan – This version of the pricing scheme allows 100% access to code & database. To the cost estimation, you can get in touch with the sales team. Customers can get deal offers, flights available, popular & recently added rentals, property search all at one place. You can have a role-based access system for admin/sub admin/users to have an effective workflow for your website. For instance, admin can control ads, news, reviews from clients and a lot more from his panel. Customers can avail both online (PayPal & 2Checkout) & offline (like instant money transfer via Western Union) payment option for making reservations. It also aid you with multiple themes & layout designs which you can easily customize to structure an outstanding booking portal. I am sure you must have jotted down the advantages of using these PHP Vacation Rental Scripts. The best part about using these scripts is that you can do the modifications as each one of them is highly flexible and is suitable for every size of rental business. Hence, you can pick any of these tools that you find best, and you are good to go. If you feel baffled about any of these scripts or want to make any suggestions, do comment in the below section.